So, the ripples continue. Somebody said it was like pebbles being tossed into the still water. This may sound strange, but I am keenly aware of the cosmic element. We tripped the wires of the cosmos. I got a nice email recently. My friend Steve Barry was honored Tuesday evening at the United States Holocaust Memorial Museum. Steve’s daughters wanted me to know that his family made a donation in his name and set up two fellowships for scholars at the USHMM in the Stephen B. Barry Memorial Fellowship. His girls mentioned me in their speech Tuesday night in Washington. Thanks ladies. You know he was a hero. He reached out and touched an awful lot of students in the short time that we were together. Steve will be one of the persons who will be featured in my book. 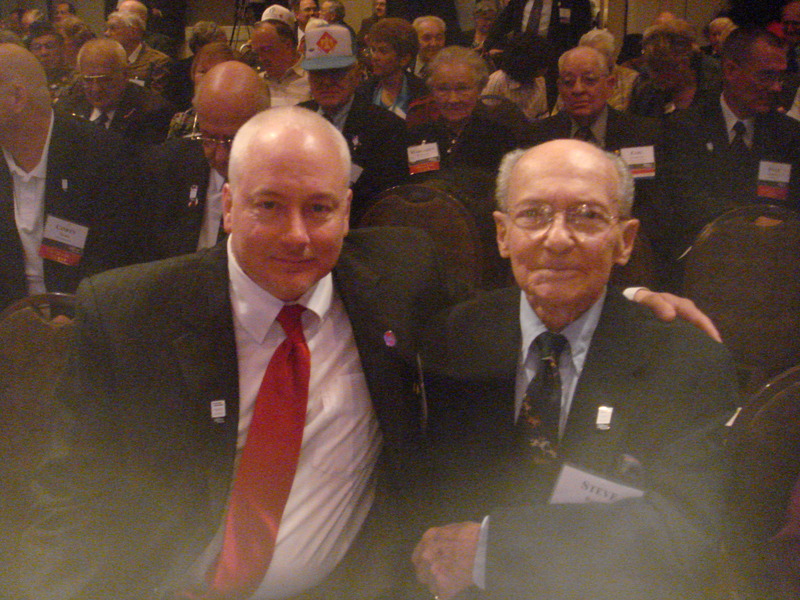 Against all the odds he survived the Holocaust and later even went on to become a US Army Ranger in the Korean War! I was pretty close to him. Right now I am wistfully looking at his homemade holiday greeting cards under my desk glass, and to my left, a foot away, are the shelves containing his Holocaust library, which was passed on to me after he passed away. He was so funny, too. He told me he nearly “choked on my bagel” a few years back when he opened his newspaper in Florida and read about me and the train he had been looking for, for so many years! I miss the guy. You can read more about him here. Steve’s name on the wall of donors, USHMM, unveiled April 29, 2014. The inscription kind of says it all. He uttered these words in my very classroom on a Thursday morning to a film crew from New York City, aimed at the 1500 students that he and the other survivors and American soldier/liberators had come to address. That Friday evening of our big soldier/survivor reunion, we watched it together on national news before our final banquet. You can see the video at the bottom-he’s the one in the preview addressing the interviewer- but the transcript is below. Diane Sawyer: And finally tonight, our Persons of the Week. It is a story that began almost 65 years ago in the darkest days of World War II. Yet this week, a new chapter unfolded. An unforgettable reunion of Holocaust survivors, and the American troops who freed them, and all made possible by a high school history class. Matthew Rozell: This is history coming alive. Veteran 1, entering school with his wife: Here we are, we have arrived! Diane Sawyer: It was 2001 when high school history teacher Matt Rozell decided to begin an oral history project. He and his students would just interview family members in the small town of Hudson Falls, New York, to capture fading stories of World War II. Interviewer (soldier’s daughter): Did you mention the train [to Mr. Rozell] at all before? Carrol Walsh, former soldier: No I didn’t tell him about the train. Diane Sawyer: The students unearthed a forgotten crossroads in history. (Gunfire, archival film footage) Near the very end of World War II, April 13th, 1945, the American 30th Infantry Division was pushing its way into central Germany. Carrol Walsh: We came to a place where there was a long train, of boxcars. Diane Sawyer: They found a train, holding nearly 2,500 emaciated Jewish prisoners, many just children, being moved from the Bergen-Belsen concentration camp, to another camp and certain death. Their German guards had just abandoned them, fleeing the Americans. Carrol Walsh: A feeling of helplessness. What are we going to do with all these people? Frank Towers, former soldier: We had never ever seen anything so, (pauses) filthy. Diane Sawyer: The American soldiers fed the prisoners, and brought them to safety. Stephen Barry: For 42 years I collected anything that I could to try to find any article regarding the train. It just didn’t exist! Diane Sawyer: But Mr. Rozell’s class put their interviews with veterans up on a website, along with these photographs taken by the American soldiers. Diane Sawyer: Out there on the web, Holocaust survivors all around the world began to notice. Diane Sawyer: A reunion of the survivors and their liberators took place this week at Hudson Falls High School. Emily Murphy, student: When they speak to us, you can’t say that you feel how they felt. But you get the feeling, you feel like you were there. Diane Sawyer: In an age where there are still those who deny the Holocaust ever existed, these survivors say they are the living proof. Stephen Barry: It’s not for my sake, it’s for the sake of humanity, that they will remember. Diane Sawyer: And so we choose history teacher Matt Rozell, his class, the Holocaust survivors of that train, and the American soldiers who kept them and their story alive. And that is World News for this Friday. I am Diane Sawyer, and from all of us at ABC News, we hope you have a great weekend. And here is a link to the 2014 United States Days of Remembrance Capitol Ceremony. Steve’s daughters and granddaughters are in the back row!